Yadda, yadda, yadda... you've heard it all. You'll never be queen. Your children won't ever amount to anything. Your father was cold-hearted and always up to no good. All the naysayers in the kingdom just love to tell you that you don't have what it take to play the game, don't they? 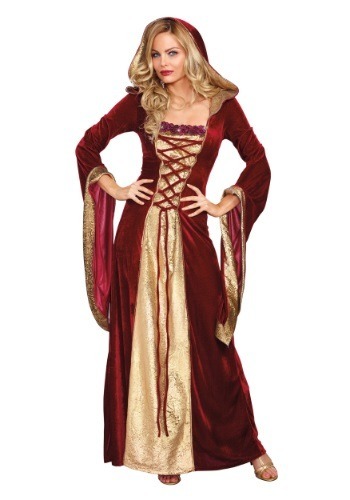 Maybe it's time you quit playing the game, and take a run at ruling the empire when you go in this Lady of the Thrones Women's costume. With an elegant, yet authoritative look, we think everyone else playing the game is going to yield to you... one way or another. With elaborate and intricate details on this gown, it will be the perfect costume look for a trip to a Renaissance festival or for a historical reenactment... or for just making sure the results of your latest plan come out in your favor! And this hooded gown is sure to have you standing out, no matter which game you happen to be playing. Rich red velvet is accented with gorgeous metallic gold brocade for a stunning, yet regal look. A square neckline is accented with a front inset panel, covered by velvet bodice lacing. 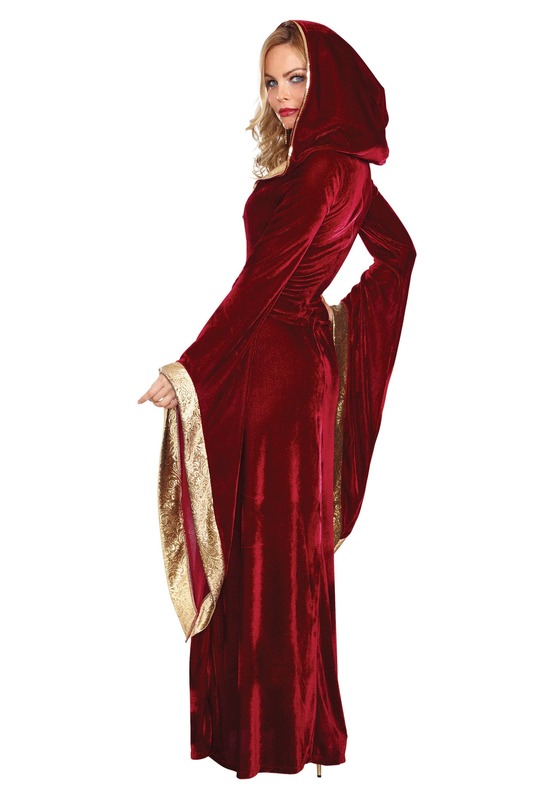 Long hanging bell sleeves add dramatic effect, and the lined hood can be worn up for an air of mysteriousness, or hanging down to show off your hair or wig. You could style your hair in a fun renaissance theme, and the only thing you're going to need to complete the queenly effect is some royal bling. But truth be told, with this elegant look, you won't even need the jewelry to feel like your the one who's going to be winning big time!